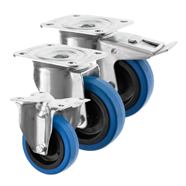 This is by far our most popular range of EU & UK INDUSTRIAL CASTORS, we can offer you a range of different size castor wheels, each with 4 versions either as swivel castors, fixed castors or swivel castors with a brake or a directional lock brake. 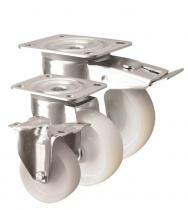 These castors are heavy duty zinc plated pressed steel with a double ball bearing top plate. This means these industrial castors are hard wearing and long lasting. 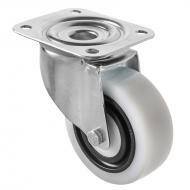 We ONLY SPECIALISE IN EUROPEAN AND UK MANUFACTURED Castors, as the quality will mean a longer lifetime use for you. 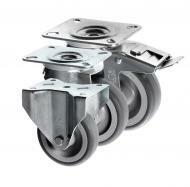 We can also offer each size and type with a choice of 12 alternative types of caster wheels. 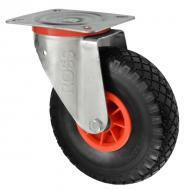 So with over 180 castors to choose from in this range you will find exactly what you are looking for! 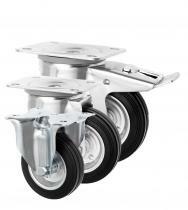 These medium duty top plate castors really can take the weight. 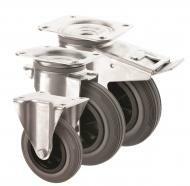 With load capacities from 50kg per castor up to 400kg per castor these industrial medium duty castors can take the weight out of your casters search! But don't worry, we have made it easy for you to find what you want. 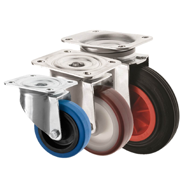 Just choose and click the type of wheel you require from either blue non marking rubber, grey rubber, black rubber, polyurethane, nylon ( with bearings) or nylon ( without bearings). 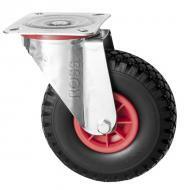 You could also choose noise reducing castors, bakery casters, antistatic and pneumatic castors. Our range and prices cannot be beaten! 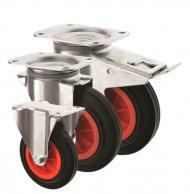 When asked what applications these castors are used for, our response is ANY! 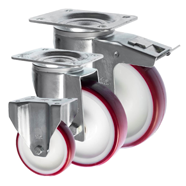 We have customers using these industrial medium duty castors in theatres, manufacturing plants, bakeries, warehouses, stadiums, shops, museums, restaurants and power stations to name but a few. WE DO NOT SELL CHINESE MANUFACTURED INDUSTRIAL CASTORS - as we just do not rate their quality!